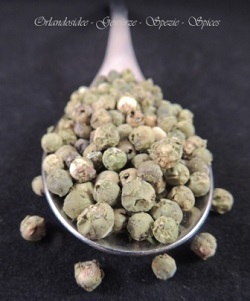 Pepper is the fruit of a flowering vine of the family Piperaceae which grows in the tropics. The Pepper Plant starts carrying berries after its 3rd year two times a year for thirty years. The pepper plant can grow up to 10 meters if its supporting tree grows that high. For commercial growing the Pepper plants are kept under a high of 4 meters. The Pepper plant needs shade and lots of water but should not stand in it or she will die. The green Pepper is made from unripe berries. The fresh green pepper berries have to be preserved by drying. Green pepper is used in desserts or in the green pepper sauce.